Fine 30's vintage belted polo style top coat. Rust, with brown and camel tan tattersall plaid wool. Wide peak lapels. Wrap front with no closures. Welt waist pockets open into inside patch pockets at hip with cotton sateen facings. Long raglan sleeves with 1/2 turn back cuff and two leather buttons. Full length inverted pleat center back. Self tie belt with loops. Welted seaming throughout. Rusty brown rayon 1/2 lining and seam finishes. Expertly tailored coat made of the finest quality fabrics for that 1930's debonair look! Shoulders, approximated measurement - 19"
Sleeves, measured from collar seam to cuff edge - 32"
Center back length, measured from collar fold to hem edge - 51"
Overall EXCELLENT Condition, consistent with it's age. 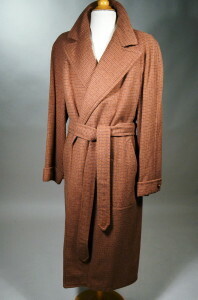 Coat shows edge and collar fold nap wear. There are also minor bites throughout but only at surface. There are some light soil marks at back that blend with pattern and difficult to see. Lining shows some minor discolor and faint soil marks. Although we have gone to some length to report the minor issues on this garment, it is an outstanding piece and totally wearable.